Do It Wrong Quickly might strike you as strange advice, but interviews with leading Internet marketers reveal it as a common theme. …packed with practical advice illustrated with numerous examples delivered with a generous dollop of humor! I absolutely love Mike Moran’s take on Internet marketing. I highly recommend this book to anyone who feels overwhelmed with the idea of marketing their business on the web. Instead of killing yourself as you spend months obsessing over everything that could go wrong with your new campaign, it’s cheaper, faster, and more effective to just try something. Marketers have become careful over the years, because getting a TV commercial wrong is career death. Because it costs so much money, requires so much lead time, and is so hard to change, TV advertising is the pinnacle of the “do it right at all costs” approach. Listen to what your customers say. The web, and web 2.0 in particular, gives your customer a printing press to express opinions that you’d never have heard back in the good old days. Customers are already having a conversation about you, using blogs, wikis, product ratings and reviews, message boards, social networks, and even hate sites (if you’re really not listening). This conversation is happening—are you listening? Watch what your customers do. The Internet is the biggest direct marketing play of all time. You can measure the response of your customer to everything you do. By carefully designing your experience, you can gather feedback based on every click. Your customers are voting with their mice—are you watching? Respond—quickly. Accept the fact that none of us can predict what our customers really want. We’re not setting out to do things wrong, but we can accept that we are doing it wrong most of the time. The point is that we need to find out that it’s wrong and fix it—fast. It’s amazing how smart you’ll look when you respond to what your customers say and do. These changes are not easy in many companies. Careers are ended with big mistakes, so admitting you don’t know what customers want and you’d like to experiment to find out—that might seem like a career-killing move. Do It Wrong Quickly is full of practical advice and stories from leading marketers on how to change the way your company does its marketing. Mike Moran is back with another book. Co-author of “Search Engine Marketing, Inc.,” Moran’s new book is called “Do It Wrong Quickly” (aff) and looks at how great businesses benefit from experimenting and adapting…In case your think that this “fail fast” approach is better on paper than in real life, Google would like to disagree with you. Matt Glotzbach, product management director for Google Enterprise told a recent conference audience that Google thrives on launching products quickly and then letting users tell them what needs improving. Now is not the time for marketers to dither around waiting to get the plan just right. Mike puts that notion to rest rapidly. Now is the time for joining the conversation and learning from the experience. Readers familiar with Moran’s previous book, Search Engine Marketing, Inc Driving Search Traffic to Your Company’s Web Site (ISBN -13: 9780131852921), published in July 2005, will find this new volume just as easy to read and comprehend. As I was told many years ago by a very wise professor, don’t equate easy-to-read with lack of insight. This book has both. Do It Wrong Quickly, just like Search Engine Marketing, Inc is packed with practical advice illustrated with numerous examples delivered with a generous dollop of humor…For most authors the completion of a single book is a personal tour de force. Completing two comprehensive books in two years is positively Herculean. Bravo! I absolutely love Mike Moran’s take on Internet marketing. Do It Wrong Quickly is not about how to do Internet marketing wrong, it’s about how to not get caught up in having to do it right so that you’ll dosomething now. Doing something wrong is far better than doing nothing right. Doing something wrong quickly is far better than doing something right slowly. The bottom line is that you simply need to do something…I’ve got a whole new philosophy. Just start doing. If I you do it wrong quickly, you can do it right later…Once you know what you’re doing to begin with. Moran, an engineer and former IBM product manager, simplifies things to the point where the least Web-savvy among us can readily comprehend most of his ideas, though more experienced readers will not feel slighted or condescended to, either…For those looking for an entertaining and informative discussion of harnessing the power of the Net by making mistakes and rapidly learning from them, this is a superb place to start. This inspired and inspirational look at the internal and external forces at work in our world would also make a great gift, but be sure that you keep a copy for yourself, too. I think that the important thing to take away is that it no longer makes sense to expect that even a carefully thought-through, well-executed marketing campaign will hit the target in today’s world. In fact, Moran believes that the new marketing means getting away from the plan-then-execute approach, and starting to try lots of approaches at the same time. In addition to systematic ways of assessing your online marketing (conversions, metrics), you have to listen better to your customers. He talks about the social media phenomenon, incorporating multi-media approaches in your message, and creating deeper relationships with your customers by engaging them in a conversation. As Moran puts it, “whether change gets your blood pumping or leaves you in a pool of sweat, marketing is undergoing a revolution more profound than any of us are likely to see the rest of our lives.” Do It Wrong Quickly is a friendly invitation to that revolution. If you spend too much time, money and effort on ineffective campaigns, this book is for you. Mike Moran, an IBM engineer, has written a guide on how to “do it wrong quickly.” Don’t be misled by the title, though—it doesn’t mean that you should purposely craft a faulty product…So, compile the metrics, analyze conversion rates and figure out which areas need tweaking. If you aren’t an expert on metrics, this 377-page guide explains the process. For those who feel they will never “get” marketing in the Web 2.0 world, Mike Moran wrote Do It Wrong Quickly. As the title suggests, Moran is a big proponent of implementing something, testing it and making improvements. Or as he says to “do it wrong quickly… then fix it, just as quickly.”…I have to admit, when I first picked up this 375+ page book, I figured I’d skim a few chapters and get the gist. Several hours later, I found myself completely immersed. Do It Wrong Quickly is a fantastic “big picture” overview of how any business – big or small – can take advantage of the web. Moran writes in a witty, conversational tone that draws you in…Overall, I highly recommend this book to anyone who feels overwhelmed with the idea of marketing their business on the web. And even if you think you have a pretty good grasp on things, I bet you’ll still pick up a few handy tips. I’m a fan of anybody attempting to increase operational agility – and Moran has more than a few nuggets of wisdom in his book. Chapter 6 presents several approaches to speeding up online targeting, messaging and feedback which are quite good…All in all this is a solid effort describing how “old” marketing rules have been rewritten by the web. I’m in dire need to learn more about marketing and sales in the Web 2.0 world…In this particular case I was fortunate enough to stumble upon…a current and amazing book on this topic. The book is, “Do It Wrong Quickly: How the Web Changes the Old Marketing Rules” by Mike Moran…This book is a must read for anyone serious about being part of the Web 2.0 world and engaging customers in conversations vs. telling them what you want them to hear. It’s chocked endlessly with examples and advice for web marketers. Grab a copy if for no other reason than if you EVER have trouble making a case to launch something new, cite a thought-leader from IBM. Works every time. I discovered Mike Moran, author of Do It Wrong Quickly. It’s a gem about today’s marketing…The book contains a ton of new information…Do It Wrong Quickly was just published so it will take a while for the word to get around but this just may be the marketing book of 2008. E-marketing is only as hard as you make it, and Do It Wrong Quickly makes it easy. Moran breaks down a complex topic into simple, easy to understand pieces, suitable for folks who know nothing about how to generate business via the Web. And he writes with enough humor and style that even experienced folks will be entertained as well as gaining a little knowledge. It was a top-notch read. The author, Mike Moran, does a great job of helping the audience, present-day marketers, understand how the direct marketing world has, and more importantly, is changing around them. The book is not a hands-on how-to book nor is it a book on theory. It provides a good mix of both extremes and I highly recommend it to anyone who is looking to gain a better understanding of Internet (Direct) Marketing. What Moran does is provide a frame and self-help tools for new product developers, in any industry, who want to improve their work in the truth-seeking front end. His data-driven approach accepts that you will not always know the right thing to do, but just try something and let your prospective customers tell you how wrong it is—then fix it and try again. 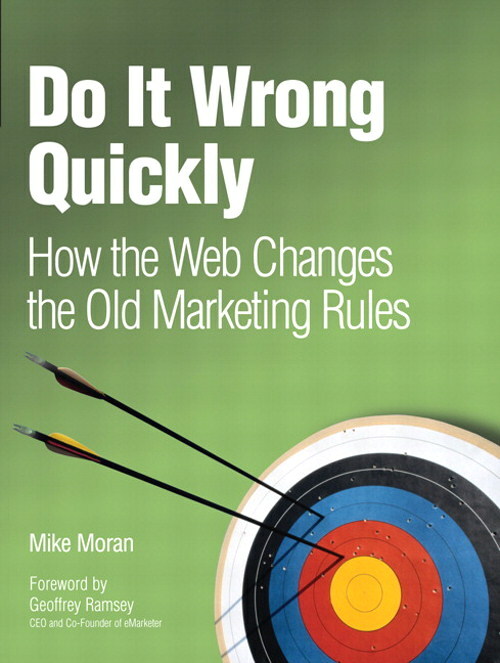 Mike Moran’s Do It Wrong Quickly: How the Web Changes the Old Marketing Rules is truly a guide for starting E-marketing. The main idea of this book is that the Internet brings significant changes to the marketing environment and there is no “rule-of-thumb”. Rather than speculating when and how the changes will affect your companies, marketers should begin experiments based on the techniques and tools introduced in this book. The principle of “Do it wrong quickly” and “improve-it-immediately” is highly appropriate in the marketing context that the Internet has defined. What’s the one thing companies care about? Conversion. Getting potential customers to convert into real, actual, customers. But how do you do that in a world of Facebook, Google, YouTube, blogs, and Flickr? Mike Moran shows you how—by trying lots of little things, studying the results, learning quickly from your failures, and doing all over again. He gives you a framework for getting over your fears of talking with your customers without a committee to protect your behind. Great book. If you are in an enterprise that has trouble executing fast enough, then act now and read Do It Wrong Quickly. It is extremely common for businesses to identify major areas for improvement or benefit but get mired down in distractions or red tape. Businesses that don’t learn to execute at the speed of business today are just going to be left behind the same way cars sped past the horse and buggy. Anything worth doing is worth doing wrong. Author of the #1 Wall Street Journal bestseller Waiting for Your Cat to Bark? Mike Moran is a true Web 2.0 marketing guru. This book is ideal read for anybody who wants to gain a better understanding of what it takes to be successful and survive in today’s new digital marketing landscape. Mike’s book is a must read! Do It Wrong Quickly captures the essence of data-driven approach to Internet marketing success. Accept that you won’t always know the right thing to do, but instead of spending months convincing yourself, just try something and let your customers tell you how wrong it is. Then fix it and try something else. Mike Moran’s book offers practical examples and terrific tips to transform your marketing to the new way, all while keeping you both interested and amused. If you read only one book on Internet marketing this year, read this one! Real insights that are easy and even fun to read. Mike has a wonderful way of seeing the new world for what it really is. Do It Wrong Quickly is a must read. If you are one the many who read Mike Moran’s excellent book Search Engine Marketing, Inc., you are already aware that Mike not only knows his stuff but also makes his points logical and understandable. His new book will likely receive attention from a variety of business executives, marketing people, and observers of the online business. Moran excels when describing his personal experiences and seeing the patterns that are changing the way we conduct business. The book is a well-researched look at how the Web has redefined marketing and how the Web will continue to be a reflection of culture. This is truly one of the best business books I have read! Mike Moran has mastered a rare combination of marketing insight, technology instinct and consumer intuition that is critical to the future of smart marketing. He takes you on a comprehensive and entertaining tour through a rapidly-changing marketing landscape, making you feel comfortable about jumping off the bus to explore it on your own. For executives looking for a tour guide to this new terrain, Mike is your man. Marketers who ignore the Web or think it’s just a fad are missing out on reaping the benefits of harnessing one of the most powerful forces for connecting with customers ever. But online marketing isn’t just an extension of traditional marketing: the rules are different. In Do It Wrong Quickly, Mike Moran describes the best practices of online marketing in a clear, compelling voice. This book should be a must-read for anyone serious about becoming a successful marketer in cyberspace. Why do some companies’ marketing efforts stumble while others dominate in this new age of marketing on the internet? With Do It Wrong Quickly, Mike Moran offers clear and insightful guidance for budding “Millennium Marketers” on how to leverage both the old and the new of Web 2.0. Combining “conversations and personalization” with the measurability of direct marketing, Moran gives readers both strategic and practical tools for engaging internet savvy customers today and in the future. The Web is wonderful at producing massive amounts of data that gets increasingly complex to interpret efficiently with each passing day, and let’s not forget taking action. Yet it is also a environment where technology enables experimentation and testing while controlling for risk. Mike’s new book lays out why we all need a radical transformation in our approach to marketing on the Web, and he does not leave us guessing about how to accomplish that. You’ll find specific ideas about how to score for your companies and your customers by doing it wrong quickly. Mike is a genius whose title should be IBM Distinguished Engineer and Marketer. This book captures the essence of how to build a winning Web site and conduct successful Web marketing in the 21st century. I highly recommend it for marketers of all kinds, both online and offline. Do it Wrong Quickly is the book I have been waiting for to give those super-perfectionist clients who won’t pull the trigger on new things. In today’s hyper-paced digital world we don’t have the luxury for everything to be completely tested and dialed in before we can act. This book is the roadmap for jump-starting projects and then making the course corrections to get perfection. Thank you Mike for making my job easier! CEO of Global Strategies International and co-author of Search Engine Marketing, Inc. Damn! Just when I thought I had some great ideas for a book, I read Moran’s manuscript and he beat me to them! So, take my advice and read Mike’s book carefully. Then reread it. Because the onion that Mike’s peeling back here reveals the essential realities we have to grasp to do marketing even half right in the wired world. It’s faster, it’s participatory, it’s less predictable and it’s certainly less controlled. That’s why you can’t deliberate too long. You just have to do it and damn the consequences. This book leads the way for new marketers, going beyond generalities, clichés, and quick fixes to offer the wisdom and insight needed to make the most of this new landscape. Not surprising really, because Mike has been a visionary in the search industry for over two decades. The real life examples and Mike’s quick wit really bring the whats, whys and hows of this new era of marketing to life. The social media world requires new approaches that transcend traditional marketing disciplines. Moran challenges, inspires, and entertains while laying out practical approaches that can help brands “Join the conversation.” An essential read for anyone looking to effectively engage the Web 2.0 world. “Doing it wrong quickly” is what we all should be doing more of, instead of fearing mistakes. In Do It Wrong Quickly, you get an entire course of Internet Marketing, including Conversational Marketing, Usability Design, Online Profiling and Audience Segmentation, Web Analytics, Conversion Marketing, and Customer Psychology. The lessons in Do It Wrong Quickly apply to any online business. If there’s one book you should read this year, it’s Mike Moran’s Do It Wrong Quickly. This book desecrates the boundaries of business, the Internet, and marketing and for the first time in history brings true professionalism to management strategy on the Web. An indispensable “walk the talk” for serious business strategies using the Web. The Internet boom made many people think that all of the rules of business had changed, but when the bubble burst many people decided that the rules hadn’t changed after all. Both extremes are wrong. Some rules have in fact changed whereas some have not, and it isn’t obvious which is which. If you want to learn how to do online marketing right in a timely manner then this book is definitely for you. Do It Wrong Quickly is more about attitude than facts, but it helps to change attitudes to use some persuasive facts. Still, I wanted the words to flow and not be broken up with footnotes or URL distractions, so I’ve listed the source for the facts in the book here. Some quotes are sourced from public speeches, but other periodical and Web sources are listed also. Quotes from marketers not listed here come from personal interviews. Internet usage is beginning to overtake TV viewing in some countries, especially among younger market segments. Newspaper circulation has seen a steady, continuous drop over the last 40 years. Smart marketers are adjusting their marketing mixes. Microsoft says that it’s shifting half a billion dollars from offline to interactive marketing by 2010. There was only one problem—Time as it turned out, did name “You” as Person of the Year. The magazine had jumped on the whole Web 2.0 trend and highlighted that everyone is a participant. Chrysler wasn’t prepared for that, and could not have been. The use of search engines has fueled this shift in shopper attitudes. Web shoppers search mainly for detailed product information and price comparisons, not information about the retailer or the manufacturer. In fact, over 90 percent of all searchers never use brand names in searches that lead to purchases. Banner ads have become less popular with marketers due to so-called “banner blindness”—eye tracking shows less than a second spent on traditional graphical banner ads by customers when they view a Web page. This banner blindness explains why less than half of one percent of banner ads are clicked by customers. Pontiac experimented with communities on MySpace and Second Life before teaming up with Yahoo! on Pontiac Underground. Most contextual advertising is text-based (just like paid search ads), but some graphical ads and even audio ads (for insertion into podcasts) are cropping up. Large advertisers are stepping into contextual ads in a big way, even in new media such aspodcasts. As high-speed broadband Internet access becomes more common, more audio and video will be created and consumed on the Web, and advertisers will look for ways to be part of that new media. Anheuser-Busch, America’s largest brewery, is encouraging beer drinkers to congregate at the MingleNow social networking site to post photos of “clinks”—two or more people tapping together bottles or glasses of beer. Will this campaign provide any buzz (beyond what you get from drinking the beer)? Perhaps not, but at least the brewer is allowing photos of any brand of beer, which increases their odds of success, because brand-fixated campaigns have not fared well. Successful social network marketing might need to be less blatant and more cheeky than traditional advertising—if it’s fun, then people will tolerate it. Burger King, for example, gave away free viewings to online videos of popular TV shows to attract MySpace friends. Social networking is not cheap, however, as MySpace charges big brands hundreds of thousands of dollars for their profiles. Perhaps that’s why Anheuser-Bush partnered with a little-known social network. Other big brands, such as Nickelodeon and Disney, have created their own child-oriented social networks, eschewing partnerships with the big players. While some estimates place spam e-mail at over half of all e-mail, marketers can still use e-mail properly and profitably. In fact, of all the companies that do marketing, 95 percent use e-mail in their marketing mix and many companies are increasing their e-mail spending. In particular, e-mail is becoming the way to alert customers to catalog updates—and four out of every five catalogs are online catalogs. Girls Learn to Ride, a Web site targeted at women who enjoy extreme sports, sends daily MySpace bulletins (private posted messages) to its 50,000-strong list of friends, soliciting subscriptions to its e-mails. E-mail is also one of the marketer’s best relationship management tools. Auto dealers prompt you to service your car, with messages personalized to you and the car you bought. So what can you send in a Web feed? Just about anything. If you can e-mail it, you can feed it. Web feeds exist for coupons, forhot deals, for products, and even housing. Feeds also can be customized. Instead of feeding customers every deal they have, Deal of the Day offers feeds on certain kinds of products to allow customers to see just what is relevant to them. You want the Web to pick up your press release, too, and you’re in luck. If you submit your press release to PR Newswire or another service that distributes releases to traditional media outlets, you’ll see that they already publish them on the Web also. In addition, some companies even distribute press releases using Web feeds, a practice that will expand. Many marketers use podcasts to reach the seemingly unreachable. Despite the small penetration to date, most experts believe blogs are taking off. Business Week has called blogs “simply the most explosive outbreak in the information world since the Internet itself.” About one in three large companies have a blogand an equal number are planning one. What happens if, instead, you continue to ignore search marketing? Lagging your competitors can damage your career, as the chief marketer of florist FTD learned after the 2005 holiday shopping season. A bad fourth quarter was attributed to the lack of search marketing—and the marketing head was replaced. One of the more creative ways to start a conversation is with a wiki. You seed the wiki with content and invite your customers to improve it. Executive Travel magazine created city guides and other information for its Web site, with a big button that says “You can contribute to this site.” The result? More engaged customers and better information. Companies are no longer ignoring blogs as a way to reach customers. Two-thirds of large companies planned to have a blog by the end of 2006, according to JupiterResearch. Why? Because they work. One-third of all Web users read blogs, including80 percent of Business to Business customers. When search engines detect these techniques, they take action. In 2006, carmaker BMW was banned from Google for cloaking its pages. This sounds good, except for what unhappy customers do next. Which is to tell everyone within earshot what happened to them. You lose the unhappy customer, yes, but also many others with him. Sometimes the experience is embellished as well, making the listener more aggrieved with the company than the one who experienced the problem first-hand. This is not theoretical. Over one third of all Americans created Web content by the end of 2005 (and this trend is growing worldwide also). Moreover, these opinionated customers spend more than the quieter ones. Perhaps more important is that the rest of your customers, the ones who don’t create content, are reading the content and being influenced by it. Three-fourths of online shoppers rely on product reviews and ratings, according to one Jupiter Research report, while another reveals that 90 percent of companies believe customer recommendations influence purchase decisions. To their credit, the folks at ABC learned quickly. They quickly restored the blog (including all the negative comments) and they responded to critics on the facts. They certainly didn’t win over their detractors, but at least they were listening and responding, creating a more favorable impression with people who had not yet made up their minds. Some even said that thefirestorm drew more attention to their show and helped raise its viewership when it aired. Customer reviews and ratings are moving beyond products into services. US telephone company AT&T has launched reviews on YELLOWPAGES.COM, allowing consumers to rate any business, from a local plumber to a global retailer. Dell’s blog began to honestly take on its customer service issues, admitting their problems and describing what Dell was doing to fix them—all in a personal and down-to-earth way by the customer service executive herself. And Dell was widely praised by bloggers for doing so, blunting its negative reputation. Listening occurs outside of blogs, too. Even a well-loved brand, such as Apple, is not immune to criticism. Casey Neistat, a longtime Apple customer, posted a video to YouTube showing him defacing an iPod poster with a complaint about the iPod’s unreplaceable battery. As the video’s message spread, Apple decided to inaugurate a battery replacement program, showing that good marketers are good listeners. Payperpost.com, for example, features a service where companies pay bloggers to shill their products. Famous brands, such as Wal-Mart and Sony, have already been caught “flogging” their products. Microsoft ended up embarrassed when they gave top bloggers laptop computers with their new Windows Vista operating system. It looked like they were trying to buy favorable reviews. BusinessWeek magazine disclosed that the entire trip was sponsored by Working Families for Wal-Mart, an organization run by Wal-Mart’s public relations firm. WFWM paid for the whole trip, including the RV itself. And nowhere was it disclosed that WFWM was a paid sponsor for the trip or the blog. It’s not known whether anyone at Wal-Mart knew about this or had anything to do with it, but they were blamed for what their PR firm did. The PR firm eventually admitted to creating two other “flogs” for Wal-Mart, too. The usual firestorm ensued, the flames fanned because Wal-Mart has so many detractors in the first place. In the end, what could have been a feel-good story connecting Wal-Mart to RVers ended up being a fiasco. By getting real (as we discussed in Chapter 2), you can avoid this fate for yourself. Instead, the company allowed the conversation to happen without them, and the damage done is incalculable. Many prospective customers to this day know nothing about Kryptonite except this story. When, in 2006, a U.S. federal court dismissed the labor union’s claims, Coke went on the offensive, buying search terms such as “killer coke,” showing ads that trumpet “Coke Lawsuit Dismissed” (with a link to the full story at Coke’s Web site). Many viral marketing successes are accidental. When videos were posted of Diet Coke bottles turning into gushers after Mentos candies were added, people rushed to tell their friends about it. No one at Coca-Cola or at Mentos had anything to do with it, but their brand names were certainly bandied about. Coca-Cola was guarded in its enthusiasm (“We would hope that people would prefer to drink [Diet Coke] more than do experiments with it”) while Mentos was thrilled, even featuring the video and background information on its home page. GM was caught by surprise, however, as their site was overrun with negative ads that mocked the SUV’s environmentally-unfriendly gas mileage and its danger to occupants of smaller cars. Other “contestants” contributed sexually explicit or profane commercials as their entries. GM responded well under the circumstances, removing the offensive ads but allowing the negative ones to remain on their site. Depending on your business, communities might be the ideal way to reach your customers. More than half of American moms say they use recommendations to make home purchase decisions-and even more do so for decisions about their children. That’s a big reason why moms use the Web, and use consumer-generated media in particular, in such large numbers. Theseonline communities help them make purchase decisions every day. So far, small companies have allowed employees to reach out to customers more than large ones have, with more small companies encouraging blogs, for example. Large companies tend to be slower to free employees from muzzle policies that prevent embarrassment and lawsuits (and prevent the kind of positive stories that word of mouth depends on). Allowing employees to be your best ambassadors is important, but equally important is avoiding negative word of mouth from disgruntled employees. When an employee is terminated or quits, make sure that you offer an exit interview to allow that employee to feel heard. Frustrated employees are more likely to turn to public venues, such as the Web, to tell their stories. Studies show, however, that Bill Payer was very typical of travel buyers. They tend to start their planning within eight weeks of their travel date. They go to a few travel search sites and perform an average of six searches, motivated by finding the lowest price, and they typically find the flight they ultimately buy two weeks before they book the tickets. Because your customers would prefer a shorter, simpler purchase process, buying cycles that include long and winding pathswould seem the ripest for marketing opportunity with better offers and a streamlined experience. If you’re wondering how anyone can measure how many e-mails are opened, remember that e-mail can be sent in the form of a Web page and the single-pixel tracking technique can be applied to it as long as the customer is connected to the Internet when opening the mail. Unfortunately, the anti-spam technology used in some e-mail systems is beginning to block images from being displayed, defeating this measurement technique. Measured open rates dropped 16 percent during 2005, but because click rates remained the same, experts believe the open rate drop is caused by image blocking technology. Take a simple e-mail campaign. Suppose you send out 1,000 e-mail messages, but 200 of them bounce, leaving 800 messages delivered. Let’s further suppose that of those 800 delivered, 400 of them are opened, and 80 of them are clicked. What’s the click rate for that campaign? Eight percent (80 divided by 1,000)? Ten percent (80 divided by 800)? Twenty percent (80 divided by 400)? It depends on whom you ask. Make sure that you understand the calculation behind any measurement you need to rely on, and standardize the definitions of these measurements within your company. Which definition you pick isn’t important as long as everyone understands it and consistently uses the same one. If, after reading this, you think this is common sense, good. Just know that you might have to convince a few experts along the way that are not comfortable with lack of precision. Experts who should know better, such as BusinessWeek, have declared Web metrics to be “a crapshoot” because different experts count the numbers differently. That’s not unlike questioning time measurement because you found several clocks that disagree. To be fair, the magazine found large discrepancies between estimates, but what was ignored is the power of the trend. The place to start to fulfill those expectations is the “look and feel.” It might seem hard to believe, but customers make up their minds about your Web site in as little as one-twentieth of a second. They’re not reading your whole page—they are getting an impression of how it looks. If your site doesn’t pass, they bang the “Back” button in the browser and look at another site. Are these rules? No, just examples. A good visual designer brings skills, creativity, and experience to each situation. A good designer also brings an individual perspective that you need to match your target audience. One interesting study by theUniversity of Glamorgan (Wales) shows that female customers seem to prefer Web sites designed by women—and men prefer those by men. If your agency or your in-house team is staffed with both male and female designers, that may give you the flexibility to appeal to all of your customers. While we are at it, make sure that your site is designed to be accessible, so that customers with disabilities can use all the major features of your Web site. It’s the law in some countries, but it’s just plain good business. Interactive marketing is a good way to reach people with disabilities because some tend to be less able to leave their homes. Moreover, they’ll sing your praises instead of bashing you in the Internet conversation about your company—the American retailer Target became a target of a highly-publicized lawsuit brought by the National Federation for the Blind. To avoid similarly negative publicity for your company, check out Web site accessibility guidance from the Worldwide Web Consortium (www.w3.org). Test your e-mail messages against popular server filters, such as SpamAssasin, to make sure they get through. In addition, consider authenticating your e-mail so that you are identified as a trusted sender. That could seriously affect the persuasiveness of your message. Consider using an e-mail delivery service such as Goodmail to get your pictures through. More and more, however, the Web experience you offer your customers is not defined totally by Web pages. In fact, Bryan Eisenberg, co-author of Waiting for Your Cat to Bark, likes to say that “The Web page is dead.” [Speech at the Emetrics Summit in October 2006] Your customer’s Web experience is a lot richer than reading a page in a book. Usability expert Jakob Nielsen describes the process of “progressive disclosure,” in which each step the customer takes allows more and more information to unfold, as the customer is ready for it. Four out of every five customers scan your Web page, with just one reading it word-for-word. Navigation pages, especially, must be clearly laid out, well-organized, and emphasize images and color over text. Destination pages, by nature, have more text. Customers are more willing to spend time reading destination pages, but those pages also need to be written to be scanned. That’s what we’ll look at next. Don’t limit yourself to these techniques. Experiment with what you believe will work with your target market and measure your success. Your title must drive clicks, especially for your ads. If you have a well-known brand name, test whether including your name in your title garners more clicks—studies show that it might. Each piece of content must be crafted to draw clicks, so that the next message can be seen. And what qualities should that message have? Jakob Nielsen, all the way back in 1997, showed that Web copy is most successful when it is concise, scannable, and objective. Podcasts are more likely to be consumed by younger customers and by people who use mass transportation, so if your product skews to these audiences, podcasts might be an especially important way to reach them. Some companies find that podcasts break through the everyday marketing clutter. Enterprise security firm Arbor Networks created a dozen four-minute podcasts patterned after the TV series “24″—each one advancing the story of a fictional financial institution whose computer network was threatened by cyberterrorists. Twenty-four thousand episodes were downloaded, spurring the company to launch a second “season” of podcasts. Global marketers should consider cultural sensibilities. GalaxoSmithKline found that Asian cultures prefer group images, while Western ones favor individual photos—Middle Eastern cultures sometimes prefer pictures of buildings. [Speech by Deanna Celotto IT Director of GalaxoSmithKline at the Web Globalization Conference in November, 2006] So, should you take the people pictures off your Saudi Arabian site? Not necessarily. You can use this information as a jumping off point, and test what works and what doesn’t on your site with your customers. Another study shows that men prefer to see shots of products alone, while women prefer to see them in the context of being used. Privacy policies have become more and more prevalent in recent years, due to customer demand. Customers have responded with an increased interest in exchanging personal information for a personalized experience, with a 2006 study by software maker ChoiceStream showing over half of Web users willing to do so. There’s more you can do. Each search visitor to your site has entered a search query that reflects a strong interest—John Batelle, author of The Search, calls the aggregated list of search keywords and clicked pages the “database of intentions.” This collection of information is interesting to many parties, but marketers should be at the head of the line. You can choose frequently-occurring keywords as triggers for special offers related to what the searcher is looking for. You can use your blog feed subscriptions to discover more than customer interests—you can determine behavioral tendencies. Continental Airlines, Delta Airlines, and Pheedz each offer vacation deals for regular customers that subscribe to their Web feeds. Carphone Warehouse Plc, a European mobile phone retailer, has taken personas one step further, by estimating the value of each persona, so they know which ones are more important than others. Relevance is the coin of the realm in e-mail marketing. Despite all the talk about how spam kings get rich, the truth is that hardworking, legitimate e-mail marketers enjoy a far more lucrative and customer-friendly existence. Jupiter Research notes that conversion rates for carefully targeted e-mails reach nearly four percent, while traditional broadcast e-mail techniques barely approach one percent. Moreover, using these techniques to deliver relevant offers yields 18 times more profit than the simpleminded blast approach. Wal-Mart sends out personalized e-mail to moms based on the birth date of their babies. “Baby Connection” is a weekly e-mail designed around the milestones that infants reach at certain ages, and of course contains appropriate products available from Wal-Mart. Simply learning a baby’s birth date makes Wal-Mart’s program effective. If you pull together all three of these elements, then your Web metrics system can trigger your marketing e-mail system to send out special offers under certain circumstances, such as for customers who abandon their shopping carts. In truth, you don’t need to use e-mail—some banner ad networks can show a special message of yours to customers who’ve already visited your site—but e-mail is the most common way to recontact. The personnel at eBay decided to leave it up to their customers. They introduced a new form link on their page that showed each customer the improved version and allowed customers to adopt the new form for themselves. When eBay saw how many people chose the new ones, they developed the confidence to replace the old forms sitewide. Why does this work? Think of it as the “right turn theory.” In countries where traffic stays on the right side of the road, studies show that far more accidents occur when drivers make left turns in front of oncoming traffic than when they make right turns. Google is one of the biggest practitioners of “beta” experiences—it introduced its Gmail and many other ideas just that way. Google goes even further, by testing tiny changes with small groups. If you ever notice that your Google search screen looks different from one shown the person next to you, it’s because Google is testing a new feature on a random subset of searchers. Hewlett-Packard and Bass Pro Shops use LTV to measure their online marketing. The best marketers know the truth of what metrics expert Jim Sterne says: “Ask good questions because we have all the answers.” [Speech at Emetrics Summit in October, 2006] An overstatement? Sure, but that’s what makes it quotable. Regardless, it’s the right attitude to have. Do companies really work this way? More and more, the answer is “yes.” Netflix, the DVD rental company, changes its site every two weeks. It might surprise you to know that they consider 90 percent of what they try to be wrong. Coping with these problems falls under a category known as list management. All e-mail marketers must continually update their mailing lists (their targets) to suppress opt-outs, to correct or remove bounces, and for other reasons, but for most marketers, it doesn’t come easy. A 2004 Jupiter Research study showed that 69 percent of e-mail marketers struggle with e-mail list churn, which is not surprising. A study by the Cranfield School of Management (U.K.) revealed how useful it can be to accurately assess the danger in a situation. Fifty entrepreneurs were characterized by their appetite for risk and their feelings of self-confidence. Guess which entrepreneurs had the strongest sales and profit growth? The ones that tested highest in risk-taking and lowest in confidence. Sometimes you lose people once you begin to “do it wrong quickly.” Usability expert Jared Spool tells the story of a Web designer at Netflix that just could not accept that the beautiful feature that he designed did not test well with customers. Rather than adapt to a feedback-based culture, the designer left his job. Sometimes negative motivation (“we’re falling behind the competition”) is just what’s needed to get people to change. As a leader, it’s critical to apply the right level of pressure—not too much or too little. Ronald Heifetz and Marty Linsky, co-authors of Leadership on the Line, call this the “Productive Range of Distress.” Without pressure to change, most people lapse into their former ways, but too much pressure causes people to panic—they either become overwhelmed and immobilized or they spin out of control. Another way to combat Specialist Disease is to put the customers in each professional’s face. Amazon rotates many of its employees into customer service periodically, so that they interact with real customers. They return to their regular roles alittle wiser about what their customers are like. Cell phones are already Net-capable—in the U.S., more than 60 percent of American cell phones can access the Web, with that number increasing every year. Browsing the Web on a cell phone has always required that marketers have a version of their Web site tuned for a phone’s small screen size. Soon, mobile Web browsers will handle Web sites designed for display on computer monitors, opening up a world of content for mobile devices. There’s a generational shift underway also. Internet users over the age of 40 are more likely to use the Web to satisfy needs, rather than for entertainment. Younger adults typically do far more online—watching videos, downloading music, and playing games. The MySpace profiles for students at some schools feature students out having fun while others show students drinking in their rooms. The Admissions department can’t control this venue where customers talk to other customers. The generation now checking out colleges online will Discover many other brands that way, too. There’s also a generational shift in attitudes toward contributing content, such as writing a product review or commenting on a blog. One-third of all American Web users over 30 have contributed content to the Web, but one-half of all those under 30 have done so. Younger people are just plain doing more things online, so that is where marketers must be to get discovered. In most industries today, customers use the Web for research (the Learn step), but they clearly Buy offline. The average American searcher spends $2.56 offline for every $1 dollar spent online and 87 percent of shoppers research products online but head to the store to buy them. Marc Andreesen, the one-time wunderkind of Netscape browser fame, is now running Ning, a company that sets up private social networks. Will they catch on? No one knows, but many companies might like a branded social networking experience tailored to their particular target markets. Today’s public social networks are relegated to the Discover step, but a branded social network could be geared to customer relationships across the Web Conversion Cycle. Some pioneers are showing the way, even today, to our private social networking future. Webkinz is a branded social network for children who own one of their $10 plush toys. Each toy comes with a code the child can use to create an avatar representation of that toy in the Webkinz virtual world. Webkinz has provided the ability to interact with other avatars, but has provided safeguards that protect children from revealing too much information to others. Do you think that children who interact in the Webkinz social network might want more plush toys? Beyond social features, faster networking speeds and Web 2.0 techniques (such as Ajax) will fuel more interactivity in the shopping experience itself. Two-thirds of shoppers today say they want their shopping experiences to be more interactive, with the ability to get more information about products and add them to their carts without leaving the page they’re on. All this added context leads to more relationship-building with your customers. Marketers dealing with younger, more connected customers are already noticing. Snack maker Frito-Lay, in targeting 16 to 24-year-olds, is building relationships by emphasizing authenticity and relevance. They’re employing social marketing campaigns which challenge customers to create their own marketing messages for Doritos tortilla chips. Semantic software might put pressure on marketers in other ways. If your customers prefer messages that are “real”—rather than bombastic—a semantic filter might serve as a “hype meter,” eliminating anything a bit too “sales-y.” Google’s Eric Schmidt has spoken about developing a “truth detector” that discerns the honesty of politicians, so marketers might not be far behind. The New Marketing Communication. The New Marketing Segmentation. The New Direct Marketing. The Three R’s of Online Marketing: You Must Be Relevant. You Must Be Real. You Must Be Responsive. The New Marketing is Not So New: Advertising. Direct Marketing. Publicity. Starting the Conversation. Learning to Listen. Getting Introduced to Others. Find Your Purpose. Measure Your Customer Activity. Measure Your Customer Relationships. The Look and Feel: The Design. The Navigation. The Interactivity. The Sights and Sounds: The Words. The Sounds. The Pictures. The Touch: Deciding Which Customers to Target. Getting to Know Your Customers. Designing Your Experience for Each Customer. Where Do You Start? How Do You Know How Wrong It Is? How Do You Speed Up? The Reasons Why Not. Fear. Change. Leading People to Change. Specialist Disease. Personality Parade. How Do You Cope with Change? What’s Changing? How Do You Keep Up?